Today’s card really is quick and easy to make. If I was going to post it to someone, I’d put it in a sturdy box to protect the star from getting squashed! If this does happen, it’s easy to make it pop back into shape! 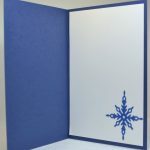 I started with a Night of Navy card base, then a layer of Whisper White Cardstock (CS), and a top layer from the Twinkle, Twinkle, Deisgner Series Paper (DSP) pack. 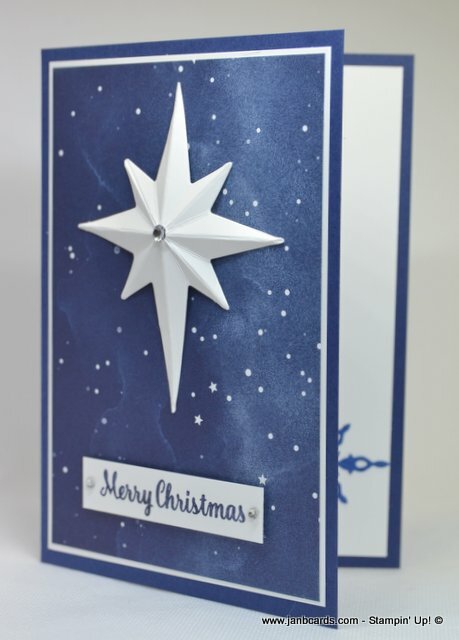 I die cut the star in Whisper White CS using the solid star die which has holes all over it from the Starlight Thinlits Dies which co-ordinates with the Star of Light Stamp Set. The die also has embossing lines that cross over the star in all directions. I needed to re-inforce the score lines, so I placed the star on my Score Board, and lined the score lines with the tracks on the board. Next I used my scoring tool to enforce the score lines that go straight from point to point. Then I very carefully folded on all four main fold lines, taking extra care when it came to pinching all the points. When I was happy with all these folds, I turned the star over and folded the lines that went from each “V” to the “V” that was directly opposite. The effect is amazing! 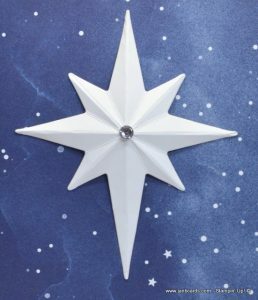 I wasn’t sure how to adhere the star to the card front, so I put a Mini Dimensional about half an inch inside the four longest points, getting it to adhere to the lowest part of the point. When I felt they were inside the points securely, I attached my star in position on the front of my card, and applied some gentle pressure! I was very pleasantly surprised when it held! For the sentiment, I chose the Merry Christmas from the Star of Light Stamp Set. I first inked it with Versamark, then Night of Navy Ink, and stamped it on a strip of Whisper White CS. I dipped the strip in some Clear Embossing Powder. After knocking off the excess Embossing Powder, I heat set it using my Heat Tool. I adhered it to the card front using Dimensionals, and added a small Basic Rhinestone at each end. 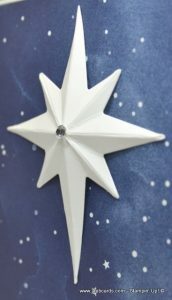 I also added one of the larger Basic Rhinestones in the centre of the 3D star. 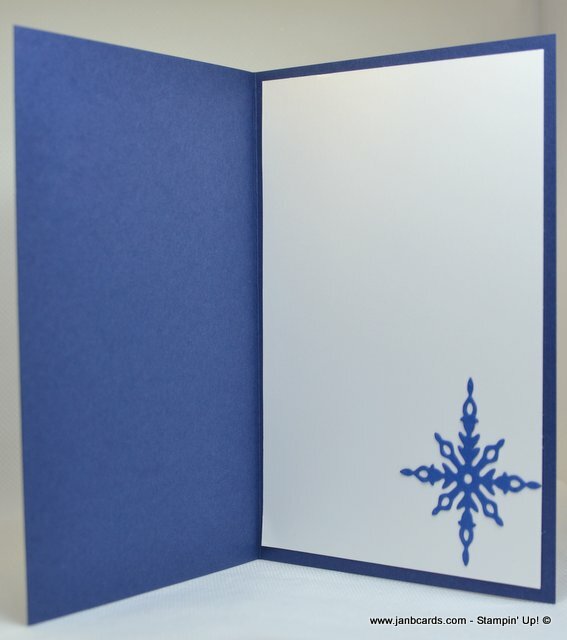 To finish my card, I added a layer of Whisper White CS inside. I added a die cut star in the bottom right hand caorner. The die I used was the smallest fancy star in the Starlight Thinlits Dies. I’m really pleased with this card, but I’ll probably send it to someone I can actually give the card to personally. Beautiful card. 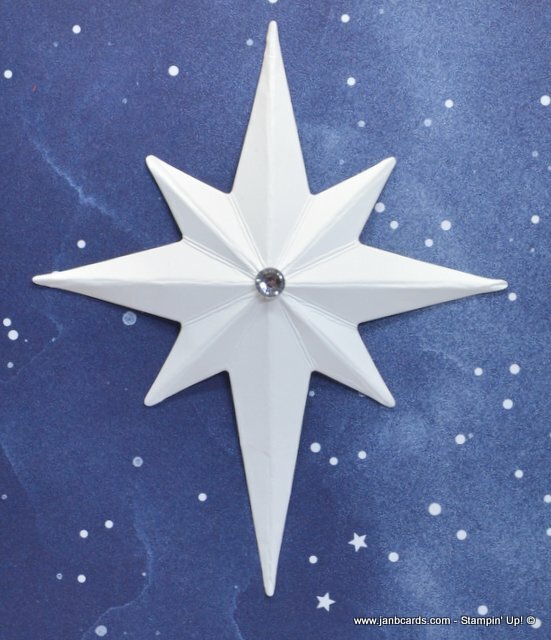 I love the way you did the folded star. Have a wonderful day.